“A true American icon and beloved father and husband, he will be dearly missed by his family, friends, and millions of fans around the world,” a spokesperson for the actor said. Born William West Anderson, the actor began his career in an unlikely place: the host of a children’s TV show in Hawaii in the 1950s. He went on to appear in a number of western TV shows in the early ’60s, including Sugarfoot, Colt .45, and Lawman, and films such as Geronimo and The Three Stooges film, The Outlaws Is Coming. In 1965, West appeared as a James Bond-esque character, Captain Q, in a commercial for Nestlé Quik, which prompted his hiring as the caped crusader in the Batman TV series. West appeared in all 120 episodes of the series and even the feature film that was released in 1966, cementing himself in comic book history for the ages and defining the superhero for generations. He would go on to reprise his role as the character in various animated shows, including The New Adventures of Batman, The Batman/Tarzan Adventure Hour, Tarzan and the Super 7, and others. In addition, he would lend his voice to the popular Batman: The Animated Series in the role of The Gray Ghost, a hero that inspired Batman in the animated series. West’s signature voice would also appear in two other Batman series, The Batman and Batman:The Brave and the Bold (where he would voice Batman’s father). 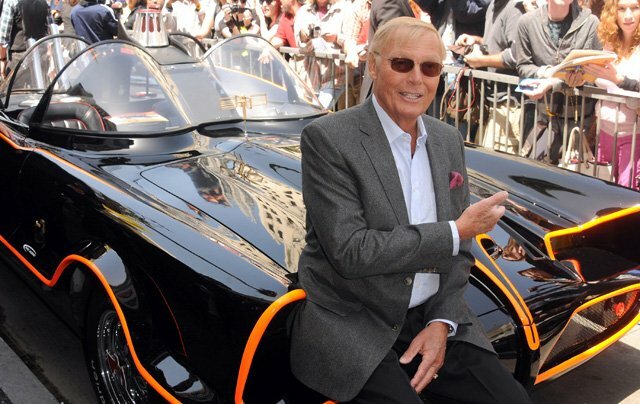 Following his first turn as Batman, West would go on to appear in a number of other TV shows and films, including The Girl Who Knew Too Much, Drop Dead Gorgeous, and Family Guy (where he voiced a version of himself). West is survived by his wife, Marcelle Tagand Lear, and his six children, five grandchildren and two great-grandchildren.